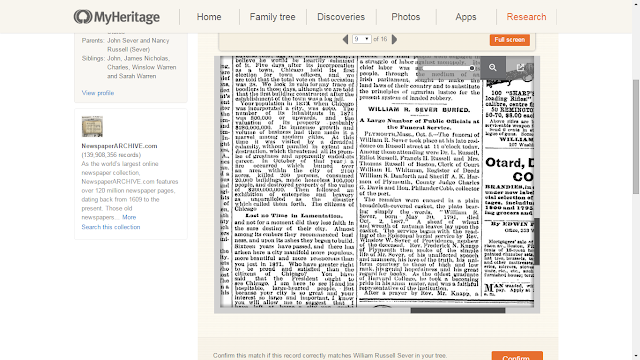 Some of my society colleagues have asked me, "Why do you like MyHeritage? I can't find anything there." My first response is "Did you upload your family tree to MyHeritage?" If they say "No," then I recommend that they subscribe and upload a GEDCOM file. If they say "Yes," then I ask "Do you have a data subscription to MyHeritage?" If they say "No," then I tell them "You have to have a data subscription in order to see records." If they say "Yes," then I ask "Have you looked at your Record Matches?" Usually, they say "No. What's that?" Well, Record Matches are the records that MyHeritage has found for persons in your MyHeritage family tree. While I sleep, watch baseball games, visit my grandchildren, write blog posts, search on Ancestry or FamilySearch - it does the hard lifting, and it does it really well. Some people have said the accuracy of Record Matches is 98%. I believe it (except for the newspapers). The search algorithms are excellent! 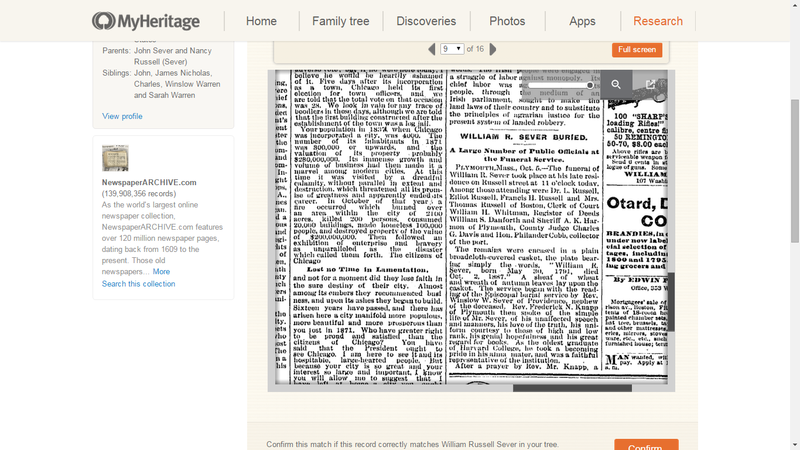 The Newspaper collection at MyHeritage is different from the collections at other websites - they are part of the Record Matches. MyHeritage seems to have access to all of the NewspaperARCHIVE collection, while Ancestry.com, apparently, has some but does not access all of the collection. "PLYMOUTH, MASS., Oct. 5. -- The funeral of William R. Sever took place at his late residence on Russell street at 11 o'clock today. Among those attending were Dr. L. Russell, Elliot Russell, Francis H. Russell and Mrs. Thomas Russell of Boston, Clerk of court William H. Whitman, Register of Deeds, William S. Danforth and Sheriff A.K. Harmon of Plymouth, County Judge Charles G. Davis and Hon. Philander Cobb, collector of the port. "The remains were encased in a plain broadcloth-covered casket, the plate bearing simply the words, 'William R. Sever, born May 30, 1791, died Oct. 2, 1887.' A sheaf of wheat and wreath of autumn leaves lay upon the casket. The service began with the reading of the Episcopal burial service by Rev. Winslow W. Sever of Providence, nephew of the deceased. Rev. Frederick N. Knapp of Plymouth then spoke of the simple life of Mr. Sever, of his unaffected speech and manners, his love of the truth, his uniform courtesy to those of high and low rank, his genial hopefulness and his great regard for books. As the oldest graduate of Harvard College, he took a becoming pride in his alma mater, and was a faithful representative of the institution. "After a prayer by Rev. Mr. Knapp, a quartet composed of Mrs. John T. Holmes, Mrs. Edward W. DDrew, William F. Atwood and Dr. Thomas B. Drew, sang "Abide With Me." Three nephews of Mr. Sever -- Rev. Winslow W. Sever of Providence, Charles W. Sever of Cambridge and A. Madera Harrison of Plymouth -- served as pall-bearers. The remains were interred in the Sever family lot in Oak Grove cemetery." This type of obituary is very formal and provides some idea of the personality and status of the individual. Usually, they provide a long list of the surviving relatives. In this case, there's just the three nephews listed. William Russell Sever (1791-1887) never married. He was the eldest son of John Sever (1766-1803) and Nancy Russell (1767-1848). He had five siblings, who all pre-deceased him. While four of them had 20 children between them, there were only four or five still alive in 1887. He is my 4th cousin 6 times removed. "William R. Sever Buried," The Boston [Mass.] Daily Globe, 5 October 1887, Page 9 of 16, column 7, William R. Sever obituary; online image, MyHeritage (http://www.MyHeritage.com : accessed 6 October 2015), NewspaperARCHIVE (www.NewspaperARCHIVE.com) collection. That was fun. now to capture the other Seaver/Sever obituaries!